The Hotel Holiday Inn Elche is exactly the sort of hotel you would expect from a member of the holiday inn family. It is located on a modern business park, but don’t let that put you off it is extremely quiet, especially during the day. The hotel is well suited for both business and personal holiday travel. The hotel is only 3km away from the Alicante airport and the exhibition centre. It is also 5km away from the centre of Elche town and only 12km away from the centre of Alicante centre. Alicante is well worth a visit as it has a stunning marina, sandy beach and plenty of shops and restaurants to keep even the most addicted shopaholic happy! This holiday inn is a very modern hotel (you can check availability and pricing here…) . it was only opened in 2006 and is wearing very well. As with all the other holiday inns it is very clean and tidy. There are 90 very comfortable, spacious rooms all of which have free wireless access to the internet if you take your own wireless enabled laptop. They also include mini bar, satellite TV, and plenty of movies to watch. The hotel has everything that you could possibly want for a very comfortable and exciting stay in Alicante. The staff are very polite, friendly and courteous, they simply can’t do enough for you! They also have cots available if you are traveling with a young baby. 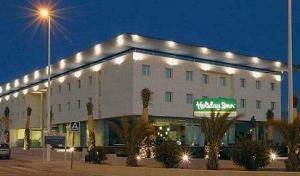 Holiday inn Elche includes a gym, sauna, restaurant, bar, business corner, and garage. The restaurant serves an A la Carte menu, and also a menu of the day. If you just want a light bite then there’s plenty to eat at the Lobby bar. There is quite a lot of choice at the restaurants, and it’s quite nice food! The business corner has computers and internet connection. There is also free WIFI internet connection throughout the hotel, but if you forgot your laptop then you can use their computers. The computers are very reasonably priced, and there is also a fax machine. The business corner includes photo copier, courier service, printer, email, internet and pc’s. This business corner is unstaffed, however staff aren’t that difficult to track down if you need them! The onsite health and fitness centre is very new and includes a gym and sauna which all guests can use. The gym contains state of the art new machines, and is included in the price of your stay. You do not need to book up for the gym, simply turn up! The staff will do pretty much anything, they will fax documents for you and even post your letters for free. Holiday inn hotels are great because they continually spend money upgrading them. When you stay in a holiday inn hotel you know that you are going to be comfortable and well looked after. ...share your opinion and write a review about your favourite Alicante hotel! I am really sure, our readers whould love to hear about why you liked it so much. It is really easy to do. Just click here and write your story about your favourite hotel in Alicante? Finding A Good Rental Car Company?